This article is about the 1983 bombing. For the 1993 bombing, see 1993 Harrods bombing. "1983 London bombing" redirects here. For the barracks attack, see 1983 Royal Artillery Barracks bombing. The Harrods bombing refers to the car bomb that exploded outside Harrods department store in central London on Saturday 17 December 1983. Members of the Provisional IRA planted the time bomb and sent a warning 37 minutes before it exploded, but the area was not evacuated. The blast killed three police officers and three civilians, injured 90 people, and caused much damage. The IRA Army Council claimed it had not authorised the attack and expressed regret for the civilian casualties. After the bombing, the IRA shifted its emphasis towards attacks on military targets on the mainland. 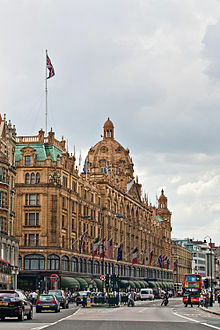 Harrods had been the target of an earlier IRA bomb on 21 December 1974 which was placed in the north-east corner of the first floor. There was a very short warning and the store was in the process of being cleared when it exploded. It was also the target of a much smaller IRA bomb almost ten years later, in January 1993, which injured four people (see 1993 Harrods bombing). From 1973 the Provisional IRA had carried out waves of bombing attacks on commercial targets in London and elsewhere in England as part of its "economic war". The goal was to damage the economy and cause disruption, which would put pressure on the British government to withdraw from Northern Ireland. Harrods—a large, upmarket department store in the affluent Knightsbridge district, near Buckingham Palace—had been targeted before by the IRA. On 10 December 1983, the IRA carried out its first attack in London for some time when a bomb exploded at the Royal Artillery Barracks, injuring three British soldiers. One week later, on the afternoon of 17 December, IRA members parked a car bomb near the side entrance of Harrods, on Hans Crescent. The bomb contained 25 to 30 lb (14 kg) of explosives and was set to be detonated by a timer. It was left in a 1972 blue Austin 1300 GT four-door saloon car. At 12:44 a man using an IRA codeword phoned the central London branch of the Samaritans charity. The caller said there was a car bomb outside Harrods and another bomb inside Harrods, and gave the car's registration plate. According to police, he did not give any other description of the car. Five people died at the scene of the bombing and a sixth later died in hospital. The bystanders who died were Philip Geddes (24), a journalist who had heard about the alert and went to the scene; Jasmine Cochrane-Patrick (25); and Kenneth Salvesen (28), a US citizen. The Metropolitan Police officers killed were Sergeant Noel Lane (28) and Constable Jane Arbuthnot (22). A third officer, Inspector Stephen Dodd (34), died in hospital from his injuries on 24 December. Constable Jon Gordon survived, but lost both legs and part of a hand in the blast. There is a memorial at the site of the blast. Yearly prizes in honour of Philip Geddes are awarded to aspiring journalists attending the University of Oxford. As a further commemoration, every year the Philip Geddes Memorial Lecture on the theme of the future of journalism is given by a leading journalist. ^ "4 Soldiers Wounded By Bombing in London". The New York Times, 11 December 1983. ^ a b c d e f g h i j "Bomb unauthorised says IRA". The Guardian, 19 December 1983. ^ Malcolm Sutton's Index of Deaths from the Conflict in Ireland. Conflict Archive on the Internet (CAIN). ^ On this Day – 1983: Harrods bomb blast kills six. BBC News. ^ "No damned Irishman will stop me, says Thatcher's husband". The Montreal Gazette. 21 December 1983. Retrieved 17 December 2013.